The Christmas Pageant is an event that all of St. Paul’s looks forward to. We include members of St. Paul’s and their friends and family of all ages. It is a simple pageant that tells of the foretelling of the coming of Jesus along with the beginning of his life. There is an easy script and many parts that do not speak. Everyone is welcome to take part even if you can not come to the rehearsals. Come early to the service and we will give you a costume and where you need to be. It’s that easy! Every year, St. Paul’s puts on two Christmas pageants on Christmas Eve: one at the 3pm service at one at the 5pm service. We rehearse on the Saturday before. This year that date is December 20th, 2014 at 10am. Participants run through the pageant and get their costumes. We will also rehearse the music for the pageant after the 10am service in the chapel. We perform on Christmas Eve during the services so get your child in costume and go sit in the pews. We will call the participants forward when the pageant will start. If you can, please fill out the form on the left hand side of the screen if you would like a part (especially a speaking part) in either pageant. We will try to give every participant their first or second choice of role. You can also look at the script as well. During Lent, St. Paul’s hosts a dinner on Tuesdays and has formation time afterwards. This year we are offing a special children’s time as well as adult formation. The children will be focusing on following God in all different times in our life. This will be a wonderful chance for our children to learn and grow during the time of Lent. On Palm Sunday, weather permitting, St. Paul’s gets a pony! One of our children dresses up as Jesus and rides the pony to St. Paul’s while the congregation follows waving palms. The pony is available before the service for any children that would like to take a pony ride! On the evening of Maundy Thursday, St. Paul’s has a service in Sherrill Hall. A table is set up in the middle of the room where the Last Supper is recreated. The choir sings, candles are lit, and we all watch the story unfold. Part of this service is the washing of feet. Children are welcome to partake in this and usually find it unique, fun, and thought provoking. After the Easter service we have an egg hunt on the lawn! We ask that you bring some stuffed eggs to contribute before the service. We have volunteers who set out the eggs and the children get to go collect. It is a fun and wonderful event. While many Episcopal children take communion from the time when they are baptized, it is wise to take some specific time to reflect on the significance of the Eucharist. At St. Paul’s, all 2nd grade students will experience St. Paul’s special program for “Communion Instruction.” In the past, this program has proven to be a highlight of the year for children and parents. Something representing your family’s most important religious tradition. Something representing your family’s future hope for the world. The period of instruction culminates in a “retreat” evening for the whole family on Saturday, May 16th from 5:30-7:30 PM. The students will then be publicly recognized in a special “Communion Recognition Day” observance during our 10:00am service on Sunday, May 17th. 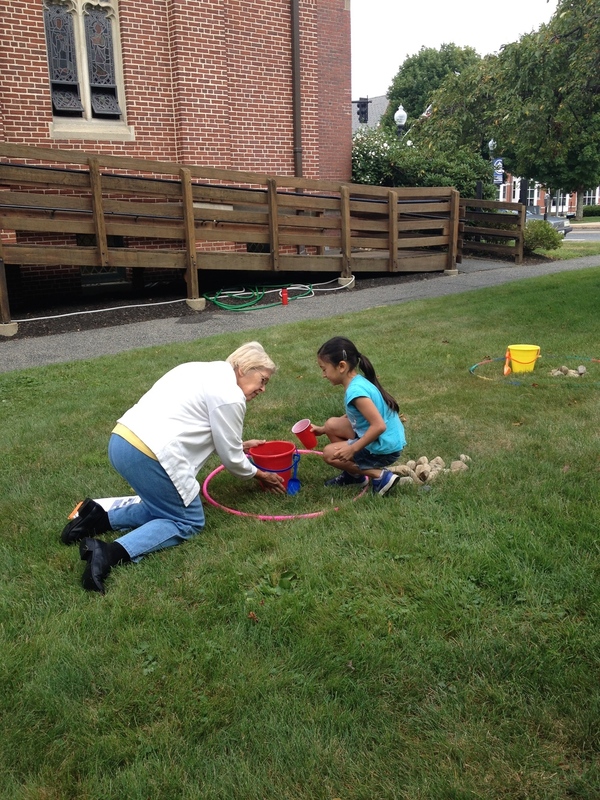 For the past two summers, St. Paul’s has put on a Vacation Bible School for one week in August. It has been a week of songs, prayers, stories, arts and crafts, puppets, and tons of fun. We have had volunteers from St. Paul’s lead around 30 children from 9am to noon from Monday through Thursday. We bring us all back together Thursday night for the parents and guardians to see what we have been up to!